The inherent purpose of a textbook is to teach the reader the basics of a topic, but ideally, also to inspire a learner to seek further knowledge. Memorizing the contents of textbooks, along with analytical thinking, is without argument an important component of higher education. For readers with some knowledge of physics, this book will make the reader think beyond the boundaries of current knowledge, about what physics is and may suggest a different view from what they have learnt from other textbooks, ”What are the differences?” ”Why?” Such serious contemplation is the first step in an intrinsic approach to physics. To discover something truly new, it is important not only to enrich one’s own knowledge but keep an open mind and pursue answers to the Why’s, Why not’s, and discover the How’s. Sometimes such innovative thinkers may appear as if they are slow learners. They think and contemplate for a long time. It is, however, from among such people who engage in deep thought that new ideas in Science are born. Pierre Curie was a poetic physicist. A so-called dropout, refused by schools, he spent his childhood immersed in Nature yet he became a rare physicist who formulated principles on symmetry, piezo-electricity and magnetism - approaching the essence of Nature. Curie also discovered radium and found an application for radioactivity. I believe that this is a book that will challenge the reader, and it is my hope, the reader, in being challenged, will be inspired to seek new answers in physics. 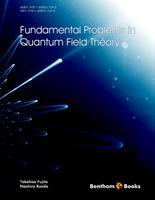 Quantum field theory has been a central subject in physics research for a long time. This is basically because the fundamental physics law is essentially written in terms of quantum field theory terminology. The Newton equation is the exception in this respect since it is not the field theory equation, but it is the equation for the coordinate of the particle object. The Newton equation can be derived from the Schr¨odinger equation in terms of the Ehrenfest theorem, and thus it cannot be a fundamental equation of motion. Therefore, the general relativity that aimed at generalizing the Newton equation to a relativistic equation is not a fundamental equation of motion, either. In this respect, the physical world is described in terms of field theory terminology, and physically interesting objects must be always the field Ψ which depends on space and time. This presents a physical state of the corresponding object in nature, and the basic equation of motion can determine the behavior of the field. This world is described by fields of photon Aµ, leptons Ψl and quarks Ψf , c which are all quantized. In addition, there are a gravitational field ς and the weak vector bosons Wµ; Zµ which are well included into the Lagrangian density. The fields of photon, leptons, quarks and weak vector bosons should be quantized, but the quantization of the gravitational field is not yet clear from the experimental point of view since there is no discovery of the graviton until now. In this sense, it is most likely true that the gravitational field ς should not be quantized. The Lagrangian density that governs the equation of motion for all the fields with four interactions (QED, QCD, weak and gravitational interactions) can be uniquely written, and at the present stage, there is no experiment which is in contradiction to theoretical predictions of the above fields. The quantum field theory has an infinite number of freedom once its field is quantized, and therefore the theory cannot be solved exactly. This indicates that we should rely on the perturbation theory when we wish to calculate any physical observables. The evaluation of the perturbation theory is well established in terms of the S-matrix theory which is essentially the same as the non-static perturbation theory in non-relativistic quantum mechanics. In the course of the evaluations of the physical observables, some of the Feynman diagrams contain the infinity in the momentum integral. The treatment of the infinity is developed in terms of the renormalization scheme in QED. The basic strategy is that the infinity in the evaluation of the physical observables should be renormalized into the wave function since its infinity in the physical observables is just the same as that of the self-energy conii tribution. At present, physical observables calculated by the renormalization scheme are consistent with the experiment. However, any physical observables like the vertex corrections should be finite if the theoretical framework is sound, and in this sense, we still believe that they should not have any logarithmic divergences if we can treat them properly with correct propagators. Therefore, it is most probable that the renormalization scheme should meet a major modification in near future. Here, we should notice that science is only to understand nature, in contrast to engineering which may be connected to the invention of human technology. Therefore, science is always faced to a difficulty and, in some sense, to a fear that some of the research areas should fail to keep highest activities after this research area is completely understood. In this respect, the field theory should survive at any time of research in science since it presents the fundamental technique to understand nature whatever one wishes to study. In this textbook, we clarify the fundamental part of basic physics law which can be well understood by now. The most important of all is to understand physics in depth, which is very difficult indeed. To remember the text book knowledge is not as important as one would have thought at the beginning of his physics study. Once one can understand physics in depth, then one can apply the physics law to understanding many interesting phenomena in nature, which should be basically complicated many body problems. In the last chapter, we discuss some problems which are not understood very well at the present stage of the renormalization scheme. Some of the open problems should be solved by experimental observations, and some are solved by modifying the theoretical considerations. The motivation of writing this textbook is initiated by Asma Ahmed who repeatedly pushed one of the authors (TF) who was reluctant to preparing a new textbook which may well displease quite a few physicists with vested rights. As a result, we concentrated on writing this book from intensive discussions and hard works with our collaborators to achieve deeper but simpler understanding of the quantum field theory than ever. We should be grateful to all of our collaborators, in particular, R. Abe, H. Kato, H. Kubo, Y. Munakata, S. Obata, S. Oshima, T. Sakamoto and T. Tsuda for their great contributions to this book.